In a battle of neighboring teams, the Baltimore Ravens cruised past the Washington Redskins during the NFL’s first full week of preseason action on Thursday night, 23-3. No shocker that Ravens K Justin Tucker nailed home three field goals, including a 59-yarder to end the first half en route to the Ravens victory. Rookie Tim White hauled in a 33-yard TD to pace the offense in his debut game for the Ravens, while Redskins fans were left wanting to see a bit more out of their offense and rookie RB Samaje Perine. With that, we give you our PFF exclusive takeaways from the contest for each team. Boyle was the highest graded offensive player for the Ravens with a grade of 80.3 on 19 snaps. He helped the Ravens control the game on the ground. Woodrum had a nice night in relief duty as he was 2-of-2 on deep passes of 20 yards or more downfield. He got the ball out of his hands quickly as he only averaged 2.25 seconds per attemped pass. Woodrum’s lone touchdown came on a throw in which he got rid of the ball in under 2.5 seconds. Undrafted rookie CB Hill was targeted nine times but allowed just three catches for 44 yards and hauled in an interception to see a paltry 10.6 passer rating when targeted, the lowest of any cornerback with a pass targeted his way this preseason. Rookie edge defender Bowser recorded a QB hit and two more pressures on just 10 opportunities to rush the passer, all totaling a pass-rush productivity of 22.5. Nsekhe was the top performer on the Washington offensive as he only gave up a single pressure on 19 pass blocking snaps for a pass blocking efficiency 95.8. Rookie RB Perine struggled in his first start as he gained just 3.0 yards per attempt and only 1.33 yards after contact per attempt. Take away his one run of 11 yards, he barely averaged over 1.0 yard per carry. Throw on top of that a fumble, a dropped pass and allowed a hit in pass protection, Perine has a long way to go over the rest of preseason. His overall grade of 38.1 was the fourth lowest of the game. Anderson impressed in his preseason debut with a two pressures rushing the quarterback. He found success rushing from both the left and right side as he totaled a pressure from each side. Anderson also notched two tackles and two stops in run defense. 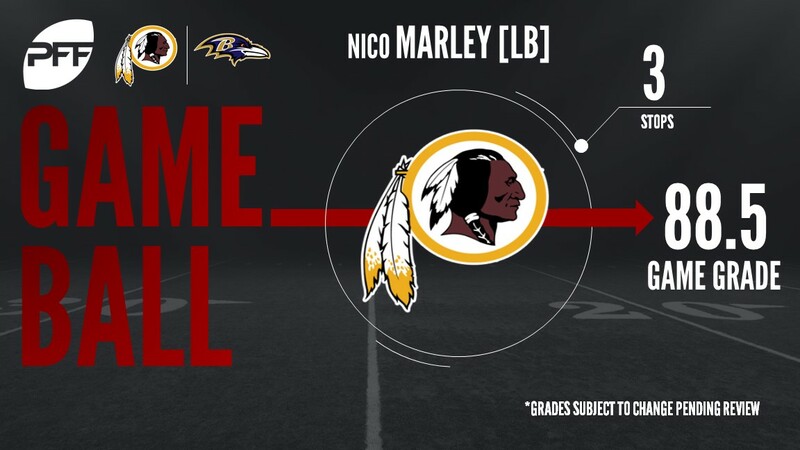 Marley was equally impressive as he finished with the highest defensive grade (88.5) on 38 snaps. Marley finished with two tackles and a run-stop on defense. More impressively was his pass-rushing productive mark of 21.9 as he compiled a hit and a sack while also missing not a single tackle in pass coverage or run defense..